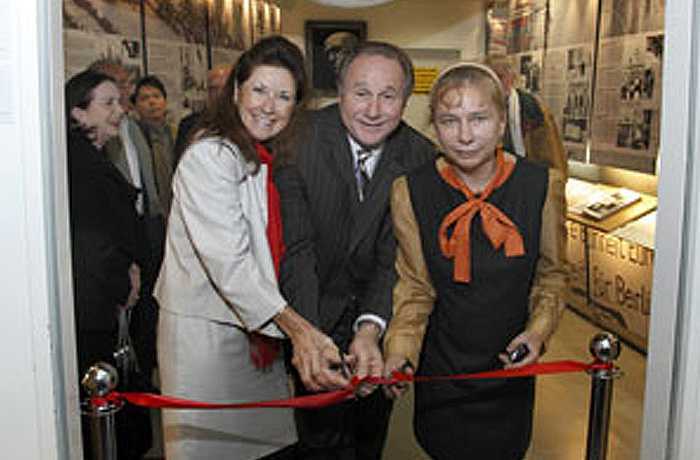 On November 7, 2009, Michael Reagan and a delegation from the Reagan Legacy Foundation opened a permanent Ronald Reagan exhibit at the Checkpoint Charlie Museum as part of the Fall of the Berlin Wall 20th Year Celebration events held November 6-9, 2009, in Berlin. It was not long thereafter on November 9, 1989, that Günter Schabowski, an official of the East Berlin SED party, announced that the citizens of the GDR were free to leave with immediate effect. A short time later, crowds flocked to the border crossings to demand their immediate opening. Local community leaders, government officials and guests joined Michael Reagan and Alexandra Hildebrandt as they cut the red ribbon and unveiled the exhibit which includes historic items such as a copy of President Reagan’s famous 1987 speech scrawled with his hand written notes, and rare personal items such as a chain saw he used at his beloved ranch in Santa Barbara, California (named “Rancho del Cielo”) which was best known as the Western White House during his presidency. Checkpoint Charlie was the principal Berlin Wall crossing point between communist East Berlin and West Berlin during the Cold War. The Museum at Checkpoint Charlie was founded by freedom fighter and human rights activist Dr. Rainer Hildebrandt in 1962 and chronicles the story of the Berlin Wall and the many successful and unsuccessful attempts at crossing. The museum served as an island of freedom where escapees were welcomed and supported. 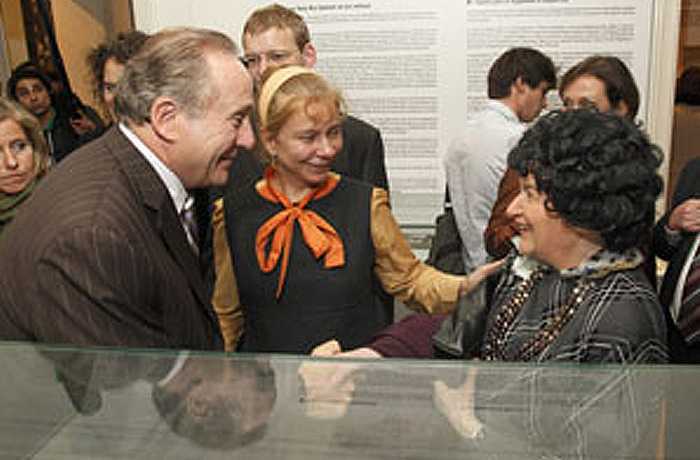 Dr. Hildebrandt died in 2004 and his wife Alexandra took over as the museum director. The exhibit marks the first major tribute in Berlin to Ronald Reagan’s historic contributions to the fall of communism and the reunification of Germany.cation of Germany.